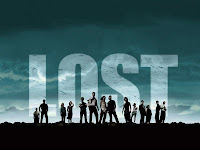 Culture Shock 05.27.10: Did 'Lost' get lost along the way? If you haven't seen the conclusion of "Lost" yet, come back later. There are spoilers ahead. So, was that the ending "Lost's" creators had in mind from the start? Probably not, because it seemed a lot like an ending cobbled together during the final season to make up for most viewers having already guessed the original ending. If you had "they're stuck in purgatory" in your office pool, you're a winner. Well, almost. It turns out the "sideways timeline" introduced in season 6 was purgatory, while the Island was pre-purgatory, or maybe semi-purgatory, but definitely not just plain old purgatory, since that's what everyone had already guessed. Whatever the Island was, it made me glad that, unlike many of my friends, I hadn't invested a lot of time and emotion on "Lost." 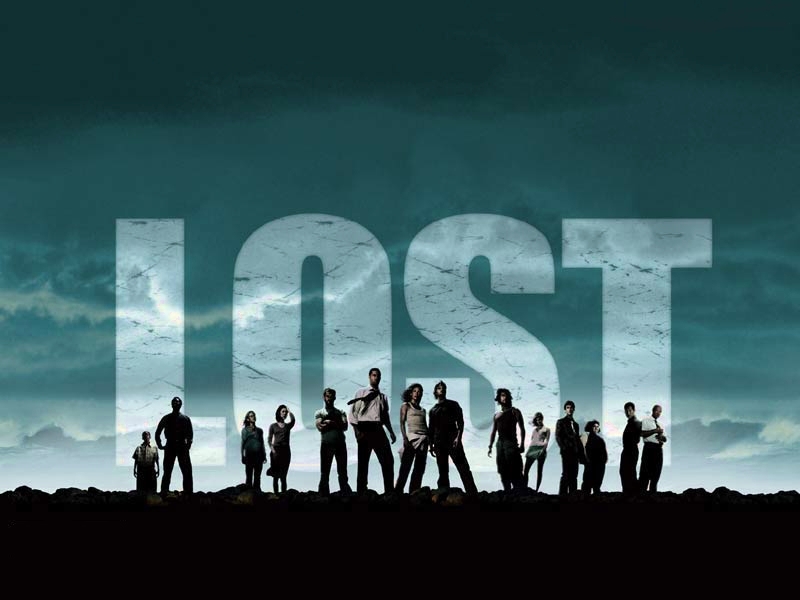 On the list of TV shows with polarizing finales, "Lost" is going to rank pretty high, along with the likes of "Battlestar Galactica" and "The Sopranos," both of which had controversial endings I'll happily defend, after enough drinks. If ABC's remake of "Life on Mars" had lasted more than one season, people would be arguing about its final episode, too. But nobody much cared about "Life on Mars." That's the difference. Viewers and critics alike really cared about "Lost" and "Battlestar Galactica" and "The Sopranos." And now some of them say they've been betrayed. A common complaint about TV dramas with complex mythologies and storylines is the writers are just making things up as they go. That's how most TV shows are made, but for mythology-rich shows like "Lost," making it up as you go is a cardinal sin. The major offender here is "The X-Files." Chris Carter clearly had no idea where his show was going, so in the end it's a miracle that all of the various conspiracy plotlines fit together as well as they did. If you have a couple of hours and a flow chart, you can see how all the threads converge. The problem with "The X-Files" isn't that Carter had no grand plan and definite endgame. It's that the show stayed on the air too long. Most shows run out of steam around season 5 — for example, "House," which has been a disappointment all year. "The X-Files" should have ended with season 7. Instead, it limped along for two more pointless, mostly David Duchovny-free, years. That's one thing "Lost's" staff writers got right. They decided to end with season 6. Besides, any longer and they would have had to explain how Hurley is the only person in history to gain weight — without resorting to cannibalism — while stranded on an island. If I'm right that the Island was originally meant to be purgatory, then "Lost's" problem isn't making it up as you go but sticking too close to the original plan while pretending you're not. Sticking with the plan has its own hazards. J. Michael Straczynski mapped out "Babylon 5" before the first episode aired. He even built in "trap doors" so he could make changes on the fly if an actor decided to leave. But he couldn't account for everything. He rushed season 4 to tie up loose ends in case the show didn't get its planned fifth season. And when "Babylon 5" did get a fifth season, it mostly marked time until reaching its predestined conclusion. So, if there's a lesson here, it's that you can have a master plan or you can make it up as you go. The risks are the same. Just don't end your TV series with anything involving purgatory. Apart from "Iron Man 2," the most exciting thing I've seen this month is, of all things, a political advertisement. Dale Peterson's ad hit YouTube on Sunday, and by Monday afternoon it was everywhere — Fox News, political blogs, and websites devoted to things that are either awesome or just plain weird. You name it. In media speak, the ad had "gone viral." By midweek, it had attracted about half a million views on YouTube, and at least one media pundit — a blogger for Time magazine — had declared it the best campaign ad ever. Hardly anyone had even heard of Peterson before his ad stormed the Internet like battalions of GIs attacking the beaches at Normandy. Now he is the most recognizable candidate in Alabama's Republican primary for state agriculture commissioner. Not that that's saying much. With everyone's attention focused on the contentious race for governor, the candidates for commissioner of agriculture are barely an afterthought. Peterson's ad is like a John Wayne western. The background music evokes "The Magnificent Seven," without being so similar as to require royalty payments. When Peterson first appears, he is, naturally, riding a horse. He's also wearing a white cowboy hat, just in case you have any doubt about who the "good guy" is supposed to be. Then he hops down, takes off his sunglasses, looks us right in the eye and goes on a glorious rant that makes him sound more than a little like R. Lee Emery's drill sergeant in "Full Metal Jacket." You half expect him to tell you to drop and give him 20. It's the political equivalent of Tourette syndrome. He even calls one of his opponents a "dummy," which is either rude or refreshingly candid or, for all I know, possibly both. But this ad is no dummy. With the help of some fast-paced editing, Peterson comes across as a decent character actor with superb comic timing. If he doesn't win the election, he could go to California and perhaps replace Emery as Hollywood's go-to military guy. Peterson tells us he's been "a farmer, a businessman, a cop, a Marine during Vietnam, so listen up." When he takes off the sunglasses, he's like David Caruso at the start of every "CSI: Miami" episode. But instead of assaulting us with a bad pun, he talks about the "thugs and criminals" who try to keep Alabama voters "in the dark." I'm not entirely certain what he's talking about, but it sounds pretty good. Besides, "thug" is a great word. People don't use it nearly enough. Thug. He does lose focus a bit when he starts talking about "illegals." I realize you can't get elected dog catcher in this state unless you support a homegrown Berlin Wall, but immigration doesn't have much to do with the agriculture commissioner's job description. Still, he gets right back on target when he fumes about his opponents stealing yard signs from his supporters. I like a politician who has his priorities straight. But seriously, it's not that he's complaining about stolen yard signs. It's that he's so deadly earnest about it. And to prove it, almost the next thing he does is brandish a rifle. Is it wrong for voters to choose a candidate based on one clever commercial? Of course it is. But voters make decisions based on lots of wrongheaded notions. So why not this one? Frank Frazetta didn't create Tarzan or Conan the Barbarian, but he did bring both to life. His brush strokes transformed fantasy into reality. Heroes and villains, monsters and maidens — Frazetta painted them all. His fantasy artwork, appearing mostly on magazine covers and paperback novels, depicted worlds that previously had resided only in the imagination. Frazetta, the father of fantasy art, died Monday after suffering a stroke at his home in Fort Myers, Fla. He was 82. Born in 1928 in Brooklyn, N.Y., Frazetta got his start in the 1940s, drawing for comic books and, later, newspaper strips like Al Capp's "Li'l Abner." But it wasn't until the 1960s that he found his true calling. That was when he began painting the cover illustrations for Robert E. Howard's "Conan the Barbarian" stories, which were published in a dozen paperback volumes by Lancer Books and Ace Books. Most of what people now think of when they think of the sword and sorcery genre comes from Frazetta's paintings. Every cliché is there, but when Frazetta began painting, they weren't yet clichés: the thickly muscled barbarian warrior wielding his ax or sword in battle, naked (or mostly naked) maidens chained to dungeon walls and sacrificial alters, hideous monsters emerging from subterranean depths to prey on the innocent. Every sinewy muscle and every lurid detail pointed to Frazetta's passion for his art, which he pursued at the expense of a professional baseball career. The 1982 film "Conan the Barbarian" starring Arnold Schwarzenegger is as much the product of Frazetta's vision as it is Howard's. And the two visions are sometimes at odds because, as Frazetta once remarked, he never read the books. "I didn't read any of it. It was too opposite of what I do. I told them that," Frazetta said. "So, I drew him (Conan) my way. It was really rugged. And it caught on. I didn't care about what people thought. People who bought the books never complained about it. They probably didn't read them." People did read the books, but Frazetta was right about one thing — no one complained. Frazetta reached his creative peak in the 1970s. He was still painting covers for the Conan series when he took up the adventures of two other classic pulp characters, Tarzan and John Carter of Mars, both created decades earlier by Edgar Rice Burroughs. 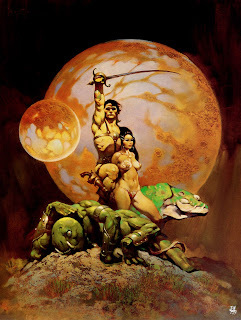 With John Carter, like Conan, Frazetta had an entire world to imagine — a Mars populated by beautiful princesses and 12-foot-tall, four-armed warriors who call their planet Barsoom. When you see Frazetta's Dejah Thoris, you immediately know why Carter would take up arms against all of Mars to defend her. Frazetta also painted magazine covers for Creepy, Eerie and Vampirella, and the 1983 animated film "Fire and Ice" was based on characters he created. His admirers include Clint Eastwood, who hired him to paint the promotional poster for his 1977 thriller "The Gauntlet," and George Lucas. Frazetta also is the subject of Lance Laspina's 2003 documentary, "Painting with Fire." And "painting with fire" is as good a metaphor as you'll find for Frazetta's work. Unfortunately, Frazetta's final year adds a sad footnote to his story. His wife and muse, Ellie, died after a yearlong battle with cancer, and their children subsequently squabbled over their father's original artwork. For the rest of us, however, Frazetta's legacy is an enduring testament to the power of what art snobs try to dismiss as mere commercial art. That legacy is right there on our bookshelves. Directing "Bad Lieutenant: Port of Call — New Orleans" is not the greatest challenge of Werner Herzog's film-making career. He did not, after all, have to drag a steamboat over a mountain. He just had to direct Nicolas Cage. Since winning his Oscar, Cage has turned in a number of lackluster performances. The less said of "Ghost Rider," the better. But in New Orleans police Lt. Terence McDonagh — the titular bad lieutenant — Cage has found a role that suits his eccentricities. Perhaps that is what drew Herzog to make a film that, at first glance, doesn't seem like a Herzog film. The title suggests either a remake of Abel Ferrara's "Bad Lieutenant," which starred Harvey Keitel, or a sequel. But it is neither. Herzog has long gravitated toward obsessed or deranged characters, finding more truth in them than in mundane reality. How else could he have survived his long partnership with Klaus Kinski, which he documented in the film "My Best Fiend"? Now, with Cage, Herzog has formed a new partnership. But the insanity remains in front of the camera. This time, there are no urban legends of the uncompromising German director threatening his star with a gun. Lt. McDonagh, however, threatens many people: young couples, drug dealers, elderly women tethered to oxygen tanks. Relentless insanity bubbles beneath his surface, rising violently only to recede again like the ocean tide. New Orleans, through Herzog's lens, is similarly relentless, a near barren post-Katrina wasteland. We see the French Quarter from its edges, but we see the Lower 9th Ward in full view. Cage's McDonagh is strangely mesmerizing, hunched over like Richard III and fueled by Vicodin and cocaine. Ironically, the bad lieutenant's bad habit is the result of a good deed. He injures his back while saving a jail inmate from drowning during Hurricane Katrina. Afterward, he must pop pills and snort lines merely to function. "Bad Lieutenant," however, is not a brief against drug abuse, although it portrays it as anything but glamorous. McDonagh is a high-functioning addict. He juggles gambling debts, a high-class prostitute girlfriend (Eva Mendes), the mob, a drug lord (Alvin "Xzibit" Joiner) and a murder investigation involving a slain family. All, however, threaten to fall, and in so doing alert his fellow officers to his illegal doings. Was McDonagh a bad cop before his injury and substance abuse? We do not know. Is he truly a bad cop afterward? By all legal and moral standards, yes. Yet he is still more ethical than his partner, played by Val Kilmer. Herzog does not offer easy answers. What, after all, is the significance of the alligator and the iguanas who, shot on a shaky video camera by Herzog himself, appear as mute spectators to the proceedings? Are they merely McDonagh's hallucinations? Or do they hold greater significance? And what are we to make of the dead man's soul, which McDonagh sees still dancing even after its corporeal home has been shot full of holes? Is it just another sign of his insanity? In the end, perhaps there are no answers, merely a punch line, but a punch line well worth the telling. For Herzog and Cage, all is a dark comedy, and the joke is on humanity. 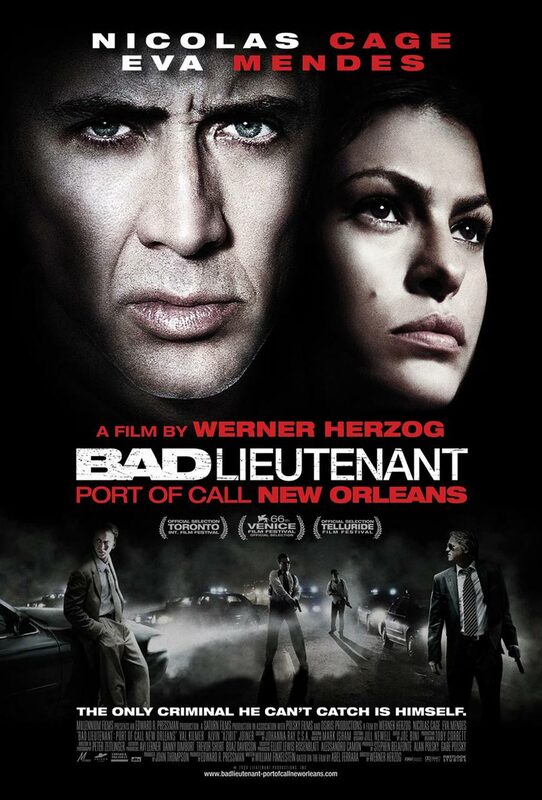 "Bad Lieutenant: Port of Call — New Orleans" is now available on DVD and Blu-ray.